Mormon Mommy Writers and Friends: Yes, But What's the Point? 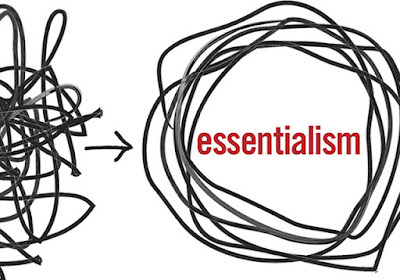 This week I have been reading a book that's been on my radar for over a year now: "Essentialism: The Disciplined Pursuit of Less," by Greg McKeown (who is Mormon, by the way). I'm only about halfway through, but it's one of those books that's giving me 'aha moments' on almost every other page. And one of these aha moments made me rethink my writing. In his book, McKeown tells the story of a journalism teacher who started class by explaining the concept of a "lead:"
"He explained that a lead contains the why, what, when and who of the piece. It covers the essential information. Then he gave them their first assignment: write a lead to a story. "The students hammered away on their manual typewriters trying to keep up with the teacher's pace. Then they handed in their rapidly written leads. Each attempted to summarize the who, what, where, and why as succinctly as possible: 'Margaret Mead, Maynard Hutchins, and Governor Brown will address the faculty on...'; Next Thursday, the high school faculty will...' Simms reviewed the students' leads and put them aside. "He then informed them that they were all wrong. The lead to the story, he said, was 'There will be no school Thursday.'" What's the point of my story? As writers, we are creative people, and we can so easily get caught up and swept away in details: a character description, a personality trait, a plot line, scenery, symbolism, etc. But what we really need to ask ourselves in all of this is: What's the point? What is the main objective you want the reader to take away from your book? And then when you're writing that character description, ask yourself: is it furthering that objective? When you're crafting that plot, is it clarifying the objective? The scenery and the symbolism- how are those contributing to your objective? It can feel virtually impossible to distill your book- your masterpiece- down to a single objective, but it is oh-so-important. After all, without knowing where you're going, how will you know whether or not you get there? I love this article. Thank you for sharing your thoughts and advice on the simplicity that needs to be at the core of what I write. You helped me right away with a blog post I've been struggling with. And thank you for keeping it brief!